It's not clear Congress would accept a deal without Canadian participation. President Trump suggested he could pressure Canada to sign the deal by placing import tariffs on Canadian automobiles. The deal does not include the sunset clause Trump had proposed, which would have ended the new agreement after five years, unless all countries explicitly agreed to extend it. Instead, the trade treaty is set for 16-year terms, with a six-year review that could recommend changes to the treaty. The U.S. and Mexico have tentatively agreed to a trade deal. And in today's announcement, President Trump wanted to make one thing clear. This new deal will not be called NAFTA, the old North American Free Trade Agreement. PRESIDENT DONALD TRUMP: This has to do - they used to call it NAFTA. We're going to call it the United States-Mexico Trade Agreement. We'll get rid of the name NAFTA. It has a bad connotation because the United States was hurt very badly by NAFTA. CHANG: All right, NPR's John Ydstie joins us now to talk about this new deal. Hey, John. CHANG: So President Trump touted this deal, this morning when talking to the Mexican president on the phone, as a great accomplishment. Can you just put that into perspective for us? Is this a great accomplishment? YDSTIE: Well, it's a step toward the renegotiation that the president promised during the campaign. But there's still a long way to go. This is a tentative agreement only with Mexico. And there's another critical party in the NAFTA agreement - Canada. YDSTIE: Canadian officials today signaled they're ready to come back to the negotiating table. They've been sitting on the sidelines for some time. In fact, Canada's foreign minister cut short a trip to Europe and is flying to Washington today. But she said she'll only sign a deal that is good for Canada. CHANG: And the president said, in his appearance this morning, that negotiations with Canada will start shortly. But then in the very next breath, he threatened Canada. Let's take a listen to that. TRUMP: I think with Canada, frankly, the easiest thing we can do is to tariff their cars coming in. It's a tremendous amount of money. And it's a very simple negotiation. It could end in one day, and we'd take in a lot of money the following day. But I think we'll give them a chance to probably have a separate deal. We could have a separate deal, or we could put it into this deal. CHANG: OK, so let me get this straight. We could end up with having two separate agreements - one with Mexico, one with Canada - instead of a North American Agreement. Is that how this is going to work? YDSTIE: Probably not. The president's strategy here appears to be flawed. The Congress gives a president the authority to negotiate trade deals. In the case of NAFTA, it's a three-country agreement. And all three parties need to be onboard to renew it. Taking this deal with Mexico to Congress separately would take a long, long time. Now, despite the president's bluster, the administration would actually like to get official notice to Congress of a deal that includes Canada by the end of this week. Under any fast-track deal, there needs to be a 90-day waiting period, so Congress has time to consider the trade deal before it's signed by the leaders of each government. Threatening Canada with car tariffs, the way the president did today, may or may not speed things up. CHANG: And the rush has to do with Mexico getting a new president on December 1, right? YDSTIE: Yeah, that's right. Mexico has elected a new president. And while his representatives have been involved to some extent on the Mexican side, it's possible he could ultimately object to some provision in the deal. And it could all unravel when he takes office. And that's a concern. CHANG: So give us a sense of what is in this agreement between the U.S. and Mexico. YDSTIE: Well, among the most important provisions are changes in rules governing automobile manufacturing. 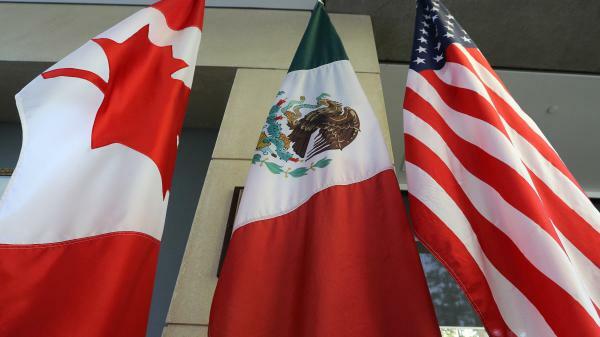 The amount of North American-made parts that cars have to have to cross borders duty-free would rise to 75 percent under this deal. That's up from 62.5 percent now. Another change would require higher wages for autoworkers in Mexico, and a large number of cars made in Mexico would have to be built in factories where workers earn at least $16 an hour. But the deal also affects trade in other areas - from chemicals to textiles. It contains new rules for digital technology and intellectual property. The stock market rose on the news today. But, again, its progress towards a new trade regime in North America but still a long way to go. CHANG: NPR's John Ydstie, thank you very much.